On the last two days of 2012 my wife Erin and I took a little journey north of Snoqualmie Pass. We went over the Kendall knob into Silver Creek, then headed north up Gold Creek to a camp just south of the Four Brothers. 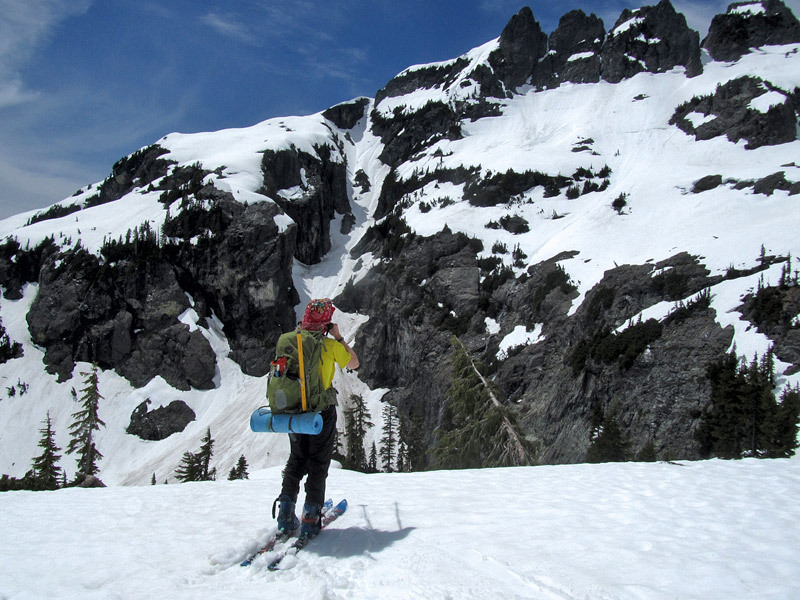 Early the next day we climbed to the ridge and dropped into a 1,400' couloir we spied last winter. It was in fantastic shape, and we had a great ski down to Glacier Lake. Then we climbed out via the col taken by the PCT, and reversed our route back out Gold and Silver Creeks, in time to get cleaned up and go celebrate new year's eve in Seattle. We saw no one on the way out, but lots of people on the way back: we counted thirteen souls (including ourselves) in upper Silver Creek at 2PM. The whole affair amounted to 16 miles and a little over 9,000 feet of gain. It was a splendid way to end the year. Spied that line last June and thought it would make a good overnight trip, way to get it in a day! Nice Forest. And thanks for setting a better skin track out of Silver Creek! Nice Forrest and Erin! way to get out a little bit further from the 'norm' and adventure outside the box...beautiful. Nice one. Also cool to be able to start a TR with 'my wife and I'. Good stuff. looks better with a little more snow! Forest, That is an awesome trip... and nice pictures. It was good to see you the other day. We'll have to get together soon for a tour such as this one. You have a good eye for sweet lines. Very nice on so many levels you two. Perfect way to start the new year. Strong work, I enjoy seeing new lines and the conditions look perfect! I'd also like to thank you for the new skin track out of silver, that was a treat! Erin, speaking of Couloirs, Have the two of you ever skied any of these lines I spied with my wife this summer? I believe your tour through silver creak basin took you under these. That is the Kendall Adventure Zone! All of those are great lines, and it's a reasonable day outing from the pass. Or you can camp out and collect them all...Super fun! That is the Kendall Adventure Zone! Ha! I love that name. The Adventure Zone! I need some adventure. Very cool! What a fantastic area, with tons of exploration potential, so close to the big city. There is a photo of the "Kendall adventure zone" floating around that names all the various lines shown in Dan's summer picture. Do you have a link for picture with route names? It's nice to have the names somewhat standardized in such a heavily used area . I finally had some free time to put the video together! Enjoy! Awesome -- the light on the hills from 1:30-2:00 in the video is gorgeous, thanks for putting it together. And the more I hear of Macklemore and Ryan Lewis, the better I like them.